We had to run to Target to stock up on swim diapers and sunscreen for the upcoming spring break in Hawaii. Reagan was being an unusually stubborn and whiney pain in the you know know what. When I suddenly noticed how peaceful things had gotten. What happened to Reagan? 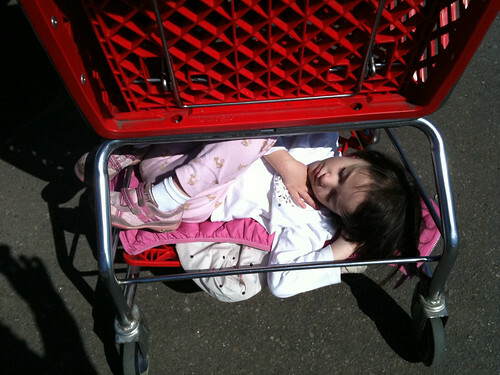 She had curled up under the shopping cart and fell asleep. We got many, “Oh my, look at that little girl. Is she actually sleeping under there?” Not the most comfortable or spacious spot but she made it work.